Vitamin B12 deficiency is common among the elderly. Elderly people are particularly at risk of vitamin B12 deficiency because of the high prevalence of atrophic gastritis–associated food-cobalamin (vitamin B12) malabsorption, and the increasing prevalence of pernicious anaemia with advancing age. The deficiency most often goes unrecognised because the clinical manifestations are highly variable, often subtle and non-specific, but if left undiagnosed the consequences can be serious. Diagnosis of vitamin B12 deficiency, however, is not straightforward as laboratory tests have certain limitations. Setting a cut-off level to define serum vitamin B12 deficiency is difficult; though homocysteine and methylmalonic acid are more sensitive for vitamin B12 deficiency, it may give false result in some conditions and the reference intervals are not standardised. At present, there is no consensus or guideline for diagnosis of this deficiency. It is most often based on the clinical symptoms together with laboratory assessment (low serum vitamin B12 level and elevated serum homocysteine or methylmalonic acid level) and the response to treatment to make definitive diagnosis. Treatment and replacement with oral vitamin B12 can be as effective as parenteral administration even in patients with pernicious anaemia. The suggested oral vitamin B12 dose is 1 mg daily for a month, and then maintenance dose of 125 to 250 µg for patients with dietary insufficiency and 1 mg daily for those with pernicious anaemia. Vitamin B12 replacement is safe and without side-effects, but prompt treatment is required to reverse the damage before it becomes extensive or irreversible. At present, there is no recommendation for mass screening for vitamin B12 in the elderly. Nevertheless, the higher prevalence with age, increasing risk of vitamin B12 deficiency in the elderly, symptoms being difficult to recognise, and availability of safe treatment options make screening a favourable option. However, the unavailability of reliable diagnostic tool or gold standard test makes screening difficult to carry out. Vitamin B12 deficiency is a common condition affecting the elderly and tends to increase with age. Acquirement of vitamin B12 into our body for cell metabolism involves dietary intake of vitamin B12–enriched foods and the absorption of vitamin B12 into our body for utilisation. The main dietary sources of vitamin B12 are animal products because animals obtain vitamin B12 through microbial symbiosis. The subsequent release of vitamin B12 from food for absorption into the body is complex and requires intact function of stomach, pancreas, and ileum. 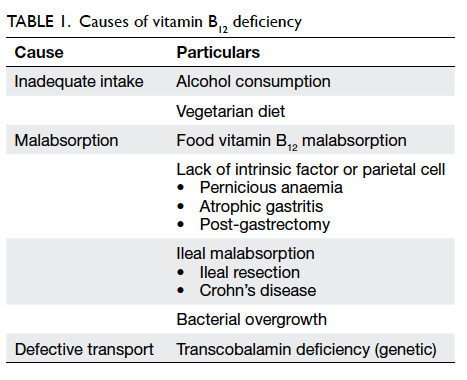 Pathophysiological changes, multiple co-morbidities, coupled with multiple drug intake, and increasing dependency associated with ageing can lead to malnutrition due to inadequate intake and malabsorption of vitamin B12, resulting in deficiency. Vitamin B12 is essential for the normal metabolism and functioning of all cells in the body. Vitamin B12 deficiency can pose significant adverse effects to organ systems with high cell turnover and metabolism like the bone marrow, gastro-intestinal tract, and brain. Fortunately, vitamin B12 deficiency can be readily treated by vitamin B12 replacement. Nevertheless, prompt diagnosis and treatment are required to prevent extensive and irreversible damage to the body. When serum vitamin B12 results are normal but still the clinical suspicion of deficiency exists, additional ‘confirmatory testing’ may help to identify vitamin B12 deficiency. There is compensatory elevation of homocysteine and MMA levels preceding the drop in serum vitamin B12 level and these are regarded as more sensitive indicators of vitamin B12 deficiency than just low serum vitamin B12 level.11 12 16 17 Elevated serum homocysteine and MMA level (>3 standard deviations above the mean in normal subjects) has a sensitivity of 95.9% and 98.4%, respectively to diagnose vitamin B12 deficiency.16 However, the reference intervals for serum MMA and homocysteine are variable among different laboratories. Serum MMA of 100 to 750 nmol/L, urine MMA of 1 to 4 nmol/L, and serum homocysteine of 6 to 29 µmol/L are the reference ranges for most methods.10 If the normalisation of elevated serum homocysteine and MMA levels in response to vitamin B12 replacement therapy is used as a diagnosis of deficiency, up to 50% of patients may be missed when the diagnosis is based on low vitamin B12 level (150 pmol/L) alone.18 19 Rise in homocysteine level before increase in MMA is an early indicator of vitamin B12 deficiency. However, this is less specific than elevated MMA level for vitamin B12 deficiency, since such elevated homocysteine levels can occur even in vitamin B6 and folate deficiency states. 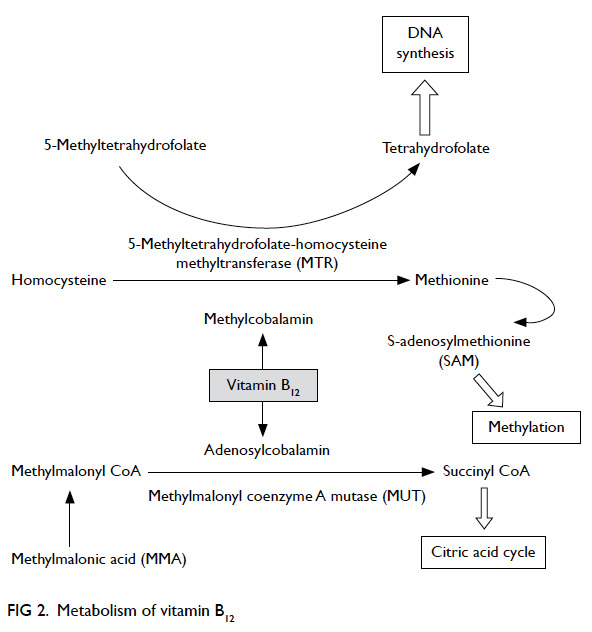 Both homocysteine and MMA levels can be elevated in renal insufficiency, hypovolaemia, and inherited metabolic defects.12 Although elevated homocysteine and MMA levels can aid in the diagnosis of vitamin B12 deficiency in people with ‘normal’ serum vitamin B12 levels, there are concerns about these metabolite assays. Some have reported that serum MMA and homocysteine levels increase with age and the prevalence of elevated MMA and homocysteine levels is higher than the prevalence of low vitamin B12 or clinically evident vitamin B12 deficiency in the elderly.19 20 21 22 In this regard, using the assay for metabolites alone may result in overdiagnosis and overtreatment. The rationale for these findings is uncertain and some have suggested that it may be related to the increased prevalence of subclinical vitamin B12 deficiency in the elderly. Moreover, these add to the controversies about whether to use metabolite estimation as the initial test to diagnose vitamin B12 deficiency. Besides, other important considerations are that they are more expensive, not readily available, and reference intervals are not standardised. Currently, the initial test for vitamin B12 deficiency is to assess serum vitamin B12 levels, and only when there is low normal vitamin B12 level, metabolite assay is most often suggested.11 12 However, the consensus for vitamin B12 threshold levels for ordering the additional tests has not yet been reached. In addition to elevation in homocysteine and MMA levels, a decrease in serum holotranscobalamin level is also considered an early marker for vitamin B12 deficiency. Holotranscobalamin is composed of vitamin B12 attached to a transport protein, transcobalamin II. It is a biologically active fraction of vitamin B12 that can be readily taken up by all cells and represents only 6% to 20% of total serum vitamin B12.23 In vitamin B12 deficiency, serum level of holotranscobalamin decreases even before elevation in homocysteine and MMA levels occurs.24 It has been shown that holotranscobalamin is the most sensitive marker for vitamin B12 deficiency, followed by MMA.23 25 Like homocysteine and MMA, holotranscobalamin cannot be tested in renal patients as its level increases in renal impairment.23 Furthermore, higher cost and lesser availability than homocysteine and MMA testing make it difficult to acquire wide clinical acceptance. As we know elderly people are particularly at risk of vitamin B12 deficiency. The main aetiologies can be divided under two main categories: inadequate dietary intake and impaired absorption of vitamin B12 (Table 1). It is believed that in developed countries, the most common cause for vitamin B12 deficiency in the elderly is inadequate dietary intake.1 15 However, studies have shown that this is far from real. A French study showed that among 172 elderly patients with vitamin B12 deficiency, only 2% accounted for inadequate intake,26 while in a hospital-based Chinese study on 52 patients, only 3.8% (median age, 73.5 years) with megaloblastic anaemia (98% had vitamin B12 deficiency) had inadequate dietary intake.27 However, this can be a problem in strict vegans because animal products are the only dietary source of vitamin B12. Usually, 2 to 3 mg of vitamin B12 reserves are stored in the body primarily in the liver, and our daily requirement of vitamin B12 is only about 2 to 3 µg. Thus, even with vegan diets, deficiency generally takes several years to develop. According to a local study on 119 older Chinese vegetarian women, the prevalence of deficiency was 42%.28 Besides, factors like poor health conditions, especially in those living in institutions, lead to inadequate nutritional intake and vitamin B12 deficiency. 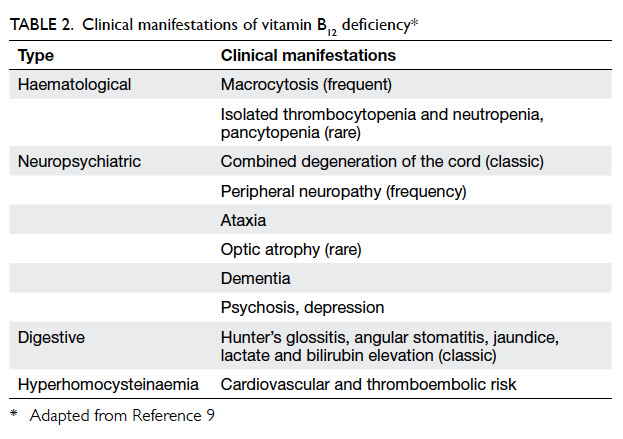 Clinical manifestations of vitamin B12 deficiency are usually non-specific and are highly variable according to severity or organ systems involved.9 There is no one clinical feature unique to all patients with vitamin B12 deficiency. Non-specific symptoms and signs are loss of appetite, diarrhoea, fatigue and weakness, shortness of breath, low blood pressure, confusion, and change in mental states.9 29 Classical manifestations include Hunter’s glossitis, megaloblastic anaemia, and subacute combined degeneration of spinal cord (Table 29). Although meta-analyses have shown reduction of cardiovascular risk with reduction of homocysteine levels,46 47 vitamin supplementation (with vitamin B6, vitamin B12, and folic acid) to lower homocysteine in the body may not be transformed into clinically beneficial vascular outcomes. In a double-blind, randomised controlled trial of 3680 adults with non-disabling cerebral infarction, subjects who received a combination of vitamin B6, vitamin B12, and folic acid showed moderate reduction in total homocysteine levels, but there was no effect on vascular outcomes (recurrent ischaemic stroke and coronary heart disease) during 2 years of follow-up.49 Probably a longer duration of treatment may be necessary or there may be other factors governing the clinical response. Therefore, we need more controlled trials to explore the vascular benefits of vitamin supplementation. Neuropsychiatric manifestations in the absence of haematological abnormalities are commonly seen in the elderly.2 50 These include paraesthesia, weakness, gait abnormalities, and cognitive or behavioural changes. Although the exact mechanism of how vitamin B12 deficiency causes neuropsychiatric disorder is unclear, the disruption of both MUT and MTR vitamin B12–dependent reactions seem to play a role. Vitamin B12 deficiency disrupts MUT reaction with accumulation of MMA; MMA is a myelin destabiliser and can affect normal myelin formation. Besides, disruption of MTR reaction leads to insufficient supply of methionine and S-adenosylmethionine (SAM), which is essential for the myelination of myelin sheath, phospholipids and neurotransmitter synthesis, for maintaining brain and nervous system function.51 Furthermore, high levels of homocysteine due to vitamin B12 deficiency are associated with an increased risk of atherosclerotic vascular disease, and this in turn may increase the risk of cognitive impairment or dementia. It has been shown that low serum vitamin B12 is associated with a 2- to 4-fold higher risk of cognitive impairment.50 The prevalence of low serum vitamin B12 has been reported to be significantly higher in the people with Alzheimer’s disease (AD).52 However, the causal relationship between vitamin B12 deficiency and the development of AD remains controversial. Amyloid deposition and hyperphosphorylation of tau protein are believed to be involved in the mechanism of AD. The SAM-dependent methylation is involved in the regulation of mechanism of presenilin I expression, γ-secretase activity, and thus amyloid levels; SAM is also involved in the regulation of tau phosphorylation.51 Moreover, hyperhomocysteinaemia has been shown to be associated with a significant increase in amyloid level and amyloid deposition on cortex and hippocampus in mouse models of AD.53 Overall, vitamin B12 deficiency may have implications in the neuropathological process of AD. In general, vitamin B12 replacement therapy helps to reverse the haematological abnormalities and psychiatric disorders. However, even after correcting serum vitamin B12 and its metabolite levels, or haematological abnormalities, the ability to reverse cognitive impairment (dementia) and neurological disorders is not promising.50 51 52 The longer the time the neurological disorder or cognitive impairment presents before treatment, the less likely it can be reversed. It is suggested that prompt correction of deficiency should be done within 6 to 12 months of cognitive impairment in order to obtain maximum response.57 Nevertheless, continuous replacement therapy may still help to prevent symptoms from deteriorating. Treatment for subtle or subclinical deficiency is still debatable although prompt diagnosis and treatment might prevent the progress to clinically overt deficiency. Vitamin B12 does not have side-effects even when prescribed in large doses.59 However, hypokalaemia, resulting from uptake of circulating potassium by newly growing and dividing haematopoietic cells, can be severe or sometimes life-threatening. Transient potassium replacement at the initial stage of vitamin B12 replacement, especially in those with low-normal serum potassium, can prevent subsequent hypokalaemia. Vitamin B12 deficiency is prevalent among the elderly. Elderly people are particularly at risk of deficiency because of the increasing prevalence with increasing age of atrophic gastritis–associated food-cobalamin malabsorption, PA, and due to drug intake for co-morbidities. Symptoms and signs of vitamin B12 deficiency are usually vague and unrecognised. Treatment may always be useful to correct clinical abnormalities like vitamin B12–related haematological abnormalities, psychiatric and depressive symptoms. For neurological disease and dementia, prompt vitamin replacement is necessary before it becomes irreversible or permanent. Both oral and parenteral administration of vitamin B12 are effective and without untoward side-effects. Overall, we are in support of screening for vitamin B12 deficiency in the elderly. However, accurate diagnosis of vitamin B12 deficiency remains controversial. To diagnose vitamin B12 deficiency, laboratory tests have their limitations, and this makes it difficult to choose a reliable and easily available tool for screening. Although there is no formal recommendation for screening for vitamin B12 deficiency in asymptomatic elderly people, the high prevalence, higher risk of deficiency in the elderly, easy and safe treatment availability warrant more liberal testing and vitamin supplementation in the elderly. 3. Lindenbaum J, Rosenberg IH, Wilson PW, Stabler SP, Allen RH. Prevalence of cobalamin deficiency in the Framingham elderly population. Am J Clin Nutr 1994;60:2-11. 4. Clarke R, Refsum H, Birks J, et al. Screening for vitamin B-12 and folate deficiency in older persons. Am J Clin Nutr 2003;77:1241-7. 10. Guidelines on the investigation and diagnosis of cobalamin and folate deficiencies. A publication of the British Committee for Standards in Haematology. BCSH General Haematology Test Force. Clin Lab Haematol 1994;16:101-15. 11. Klee GG. Cobalamin and folate evaluation: measurement of methylmalonic acid and homocysteine vs vitamin B12 and folate. Clin Chem 2000;46:1277-83. 14. Conclusions of a WHO technical consultation on folate and vitamin B12 deficiencies. Food Nutr Bull 2008;29:S238-44. 18. Stabler SP. Screening the older population for cobalamin (vitamin B12) deficiency. J Am Geriatr Soc 1995;43:1290-7. 19. Pennypacker LC, Allen RH, Kelly JP, et al. High prevalence of cobalamin deficiency in elderly outpatients. J Am Geriatr Soc 1992;40:1197-204. 21. Joosten E, van den Berg A, Riezler R, et al. Metabolic evidence that deficiencies of vitamin B-12 (cobalamin), folate, and vitamin B-6 occur commonly in elderly people. Am J Clin Nutr 1993;58:468-76. 24. Herbert V. Staging vitamin B-12 (cobalamin) status in vegetarians. Am J Clin Nutr 1994;59(5 Suppl):1213S-22S. 27. Chan CW, Liu SY, Kho CS, et al. 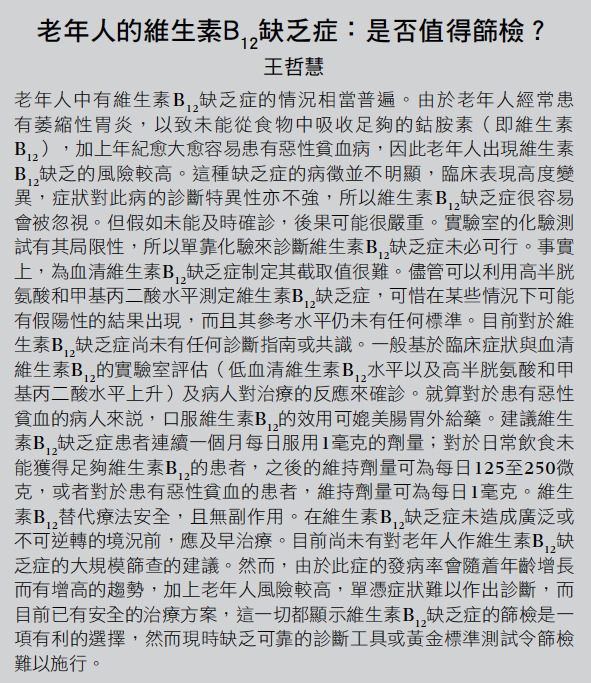 Megaloblastic anaemia in Chinese patients: a review of 52 cases. Hong Kong Med J 1998;4:296-74. 31. 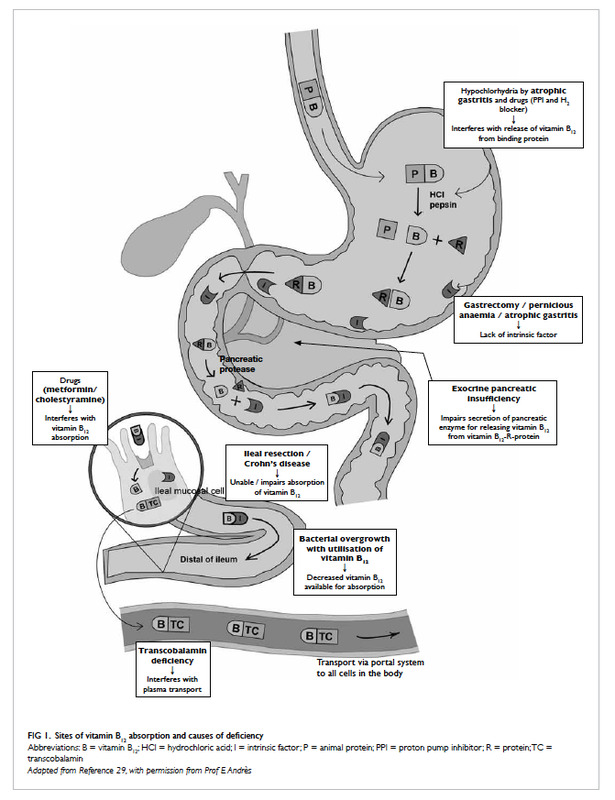 Carmel R. Cobalamin, the stomach, and aging. Am J Clin Nutr 1997;66:750-9. 32. Selhub J, Bagley LC, Miller J, Rosenberg IH. B vitamins, homocysteine, and neurocognitive function in the elderly. Am J Clin Nutr 2000;71:614S-20S. 33. Krasinski SD, Russell RM, Samloff IM, et al. Fundi atrophic gastritis in an elderly population. Effect on hemoglobin and several serum nutritional indicators. J Am Geriatr Soc 1986;34:800-6. 37. Carmel R. Ethnic and racial factors in cobalamin metabolism and its disorders. Semin Hematol 1999;36:88-100. 52. Malouf R, Areosa Sastre A. Vitamin B12 for cognition. Cochrane Database Syst Rev 2003;(3):CD004326. 56. Sabeen S, Holroyd S. Vitamin B12 and psychiatric illness. Ann Longterm Care 2009;17:32-6. 57. Martin DC, Francis J, Protech J, Huff FJ. Time dependency of cognitive recovery with cobalamin replacement: report of a pilot study. J Am Geriatr Soc 1992;40:168-72. 58. Vidal-Alaball J, Butler CC, Cannings-John R, et al. Oral vitamin B12 versus intramuscular vitamin B12 for vitamin B12 deficiency. Cochrane Database Syst Rev 2005;(3):CD004655. 59. Food and Nutrition Board, Institute of Medicine. Dietary reference intakes for thiamin, riboflavin, niacin, vitamin B6, folate, vitamin B12, pantothenic acid, biotin, and choline. Washington, DC: National Academy Press; 1998.